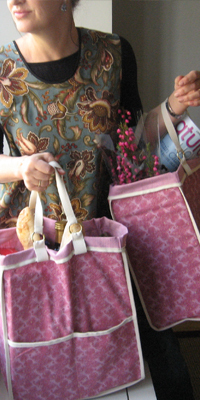 Designed by a local artist, these bags are beautifully made of hemp and cotton with finished seams inside and out. They will last longer and stand up to rougher use than all-cotton would, never mind the poly "dollar versions" from the grocery store. Two pockets on one side, one on the other hold a magazine, grocery list or your cell phone. And, as if all that's not enough, these stylish bags are made in natural prints that will coordinate beautifully with your lifestyle. We have priced our bags as low as we can to encourage shoppers to consider buying a set. But when they're gone, they're gone! 55% hemp, 45% cotton, excluding trim. 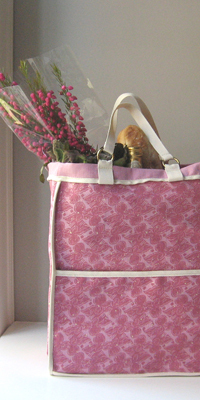 16"h x 13"w x 7.5"d.
Market Tote in Raspberry Radish Fabric.